North Lenoir Fire & Rescue is a volunteer agency that relies heavily upon the talents of dedicated individuals willing to donate time to their community. 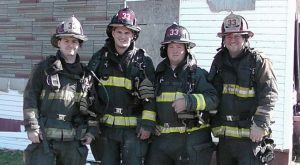 Becoming a volunteer firefighter can be an exciting and rewarding experience. No former training is required, and all equipment and training will be provided free of charge. All it takes from you is a commitment to serve and the willingness to learn. If you are interested in serving your community as a volunteer firefighter with North Lenoir Fire & Rescue, please fill out the form below and we will contact you. – Live within a six (6) mile radius of North Lenoir Fire & Rescue Station 1, 2, or 3. – Must not be on the active roll of any other volunteer fire department. This does not apply to those who are members of volunteer rescue squads, volunteer EMS services, or paid fire departments.